Paul Urkijo Alijo's stunning Spanish horror fantasy has received a first trailer today. 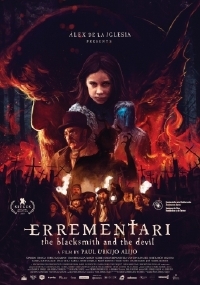 Errementari tells the story of a lonely blacksmith and his deal with the Devil. Errementari will screen at Frightfest, in Glasgow before continuing on to other festivals through 2018. It's been 10 years since the first Carlist War of 1833. In a small town in Álava, a government commissioner named Alfredo investigates an event that takes him to a sinister smithy deep in the forest, where a dangerous and lonely blacksmith lives Patxi. The villagers in the area tell dark stories about him related to robberies, murders and demonic pacts. Until by chance an orphan girl named Usue manages to sneak into the mysterious smithy, uncovering the terrible truth behind Patxi the Blacksmith.